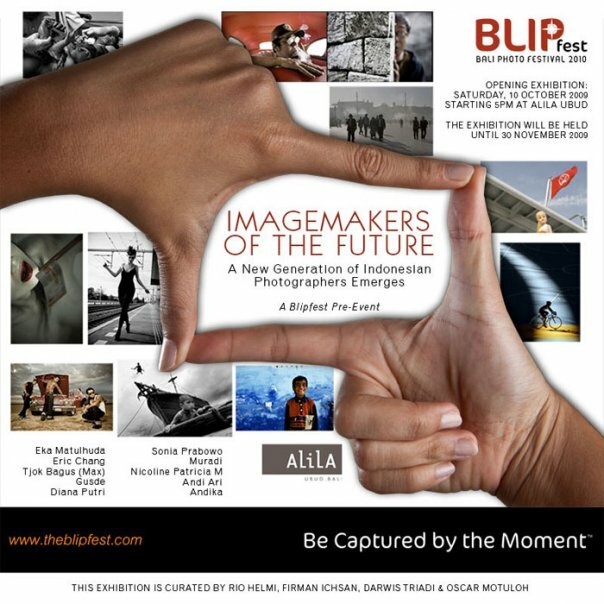 On Saturday, 10th of October 2009 BLIPfest in conjunction with Alila Ubud proudly presents “Imagemakers of the Future”, an exhibition showcasing the works of emerging young Indonesian photographers who are in the first years of their careers. Taken from different areas of the photographic spectrum, they represent the future of the already rich field of Indonesian photography. BLIPfest (Bali Photography Festival) is a major international photography event hosting an array exhibitions, workshops and seminars in Bali, Indonesia. A first for Bali, BLIPfest will take place during the last week of September into the first week of October 2010. The events of BLIPFEST 2010 will be spread over venues around Denpasar, Kuta, Nusa Dua and Ubud, Bali. BLIPfest was conceived of by Indonesian photographer Rio Helmi as a platform for Indonesian photography, as a creative impetus for artistic and aesthetic energies, and as a venue for intercultural interaction fostering the advancement of Indonesian photography within a global milieu. BLIPfest sets it’s sights on bringing together domestic and foreign photographers, editors, art critics, cultural observers, industry stakeholders and the general public to help put Indonesia in its rightful place as a domain of diverse and outstanding creativities. BLIPfest aims to be a stimulus for cultural interaction and collaboration among Indonesian and foreign photographers of the world. BLIPfest curators will include senior Indonesian photographers Darwis Triadi, Firman Ichsan, Oscar Motuloh, Rio Helmi and Tara Sosrowardoyo. At this early date we have sincere interest in participation from several foreign photographers including San Francisco of Fine Arts lecturer Linda Connors, VII agency photographers John Stanmeyer and James Nachtwey, as well as Magnum’s Raghu Rai.